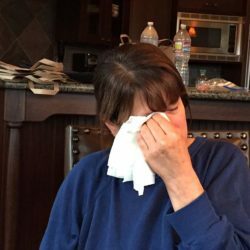 I’ve been crazy busy since we got back to town, repairing the tree, our house, the dishwasher, settling back in, and teaching classes. While juggling all this, I’d been working on putting together some ideas for a class “Eating the Colors of the Rainbow.” Red, orange, yellow, green, blue, and purple are the colors of the rainbow — and the colors of a healthy, vitamin and nutrient-rich diet! Purple, blue, red, and orange are considered to be the most antioxidant-rich foods. In general, the deeper the color pigment, the more densely packed with nutrients the food is. If you start incorporating as many colors as possible onto your plate, you’ll reap the benefits of these healthful hues. It’s not hard to do, and once you adapt to a colorful diet you’ll feel alive, inside and out! If you don’t eat this way currently, then try it, and pay attention to your body, and temperament – see if you feel a difference. This was the topic of my class, and while I shared a full menu of colorful and healthy foods, I ended it with this dessert. I think everything is fine in moderation – a beautiful fresh fruit tart was the perfect ending to our meal. 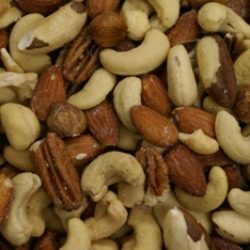 In fact, since the class was just before Labor Day, I shared how a nutritious meal, high in antioxidants and vitamin rich, could satisfy everyone – and it did! I came up with the idea for this tart from a dip that I’ve been making for years. I used this simple dip as the filling. Prepare a homemade pie crust or simply use a ready-made Pillsbury crust that you roll out. Don’t feel skilled for even that? Then purchase the frozen pie crust (large or mini shells) and bake, then fill. You’ll see this recipe is as easy as 1-2-3. My students couldn’t believe how quick it was to put together, and how beautiful and tasty it was. I hope you’ll try it. Crust – Roll out dough to fit bottom and sides of an ungreased 10” tart pan, trimming any edges that hang over the top. Prick bottom and sides with a fork. Bake in preheated 400F degree oven for 10-12 minutes or until golden brown. Remove and cool. Filling – Blend cream cheese and marshmallow cream until smooth. Spread over pie shell. Topping – Lay sliced kiwi on the filling, around the circumference of the pie while overlapping the slices. Then place a row or two of raspberries next to the kiwi around the pie. Top with the remaining space left in the center of the pie with the blueberries. Take 1 teaspoon of Apple Jelly and heat in the microwave for about 15-20 seconds. Remove, stir and add a touch of water to thin the jelly. With a pastry brush, gently dab a thin layer of the jelly over the fruit to create a glaze. Refrigerate until ready to serve. A cream cheese dip as the tart filling…that’s a genius idea! I love how you arrange the fruit topping…so artistically Beautiful! I love that filling. I use it as a fruit dip. Make kebobs and serve with dip or just with fresh fruit – it’s so refreshing. As usual, you’ve got me drooling. My family was drooling as well. It’s delicious! Simply gorgeous, Vicki! And I love the sound of your easy filling! Sorry to hear that. Have a safe trip. They’ll probably enjoy the ride. So pretty Vicki and I love how easy it is to put together. This would be a perfect dessert to pull out of the hat when unexpected guests are arriving! It definitely is so long as the ingredients are on hand. An absolutely beautiful tart: and that comment comes from one who has not bitten into a tart, cake or biscuit in over 30 years 🙂 ! I was so happy to read of your class stressing the importance of a spectrum of strong colours in our food: this is very much how I eat, write and teach!! Without learning a lot of food chemistry [perchance stifling a yawn in the process 😉 !] one knows one is both preventing and curing disease and the dishes are so great to eat anyways !!! I agree and honestly it’s more enjoyable to view a plate filled with color rather than brown and white. Plus in the end it makes you feel alive inside and out so what could be better. Gorgeous tart! And that plate is the perfect color for it. Simple is so often best, isn’t it? I often use tons of color in my food simply because it looks pretty! And the health benefits are obviously nice, too. Anyway good stuff – thanks. I’m glad you like my inexpensive plate that I use often. Who knows where I purchased it but it’s come in handy. I hope you’ll try my simple and delicious tart! My husband was just asking for me to make him a fruit tart! They are his favorite! 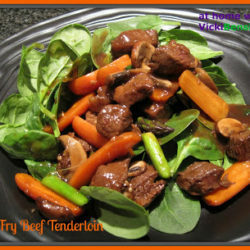 This one is yummy and easy to put together. I hope you’ll try it. Vicky! This look absolutely beautiful!!! That is picture-perfect. 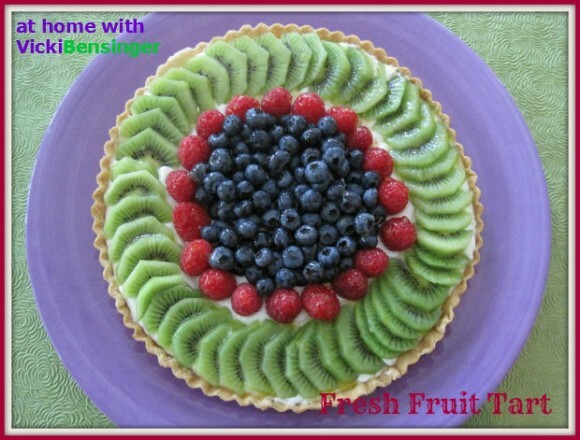 A lovely fruit tart that would be ideal for all the backyard barbecues this holiday weekend. Thank you and this is from one that’s not much of a designer. It’s definitely easy to put together and so delicious! I hope you’ll try it. Please try it, it’s so good. Thank you for your comment. Your fruit tart is so pretty and inviting. Just the way I remember seeing them in the neighborhood pastry shop in France. Tarts are so fun to make too and they are quick to make as well. Oh you’re so sweet Helene, I could only dream of one of my tarts being in a pastry shop in France. Tarts are easy to make but have to admit I’d never really made a fruit tart before like this. I didn’t think I was artistic enough to pull it off. I fooled myself. It was so easy to decorate. The best part were to ooh and aahs I received when I brought it to the table. That alone was thrilling. A stunning dessert would be on the table in a short period of time. It looks delicious Vicki. It was, please try it. Lots of color, lots of vitamins adn lots of goodness! Delicious looking tart and I love that you’ve made it so easy! It looks like it took you all day, it’s so lovely! I love that as well. My daughter just asked me to make this for the weekend. It was so easy and so good. I hope you’ll try it. 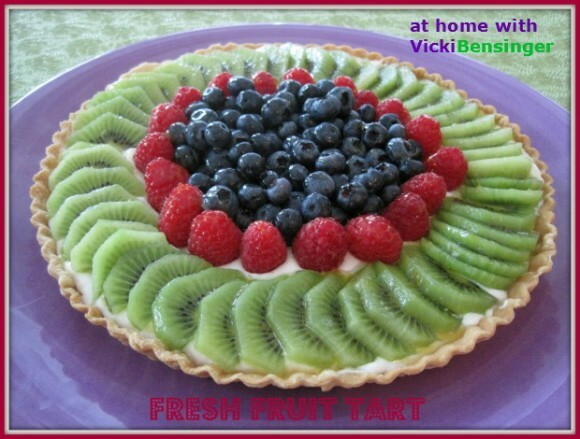 I love how summery and colorful this tart is, Vicki! Absolutely beautiful and perfect for parties! I agree. When my class saw me make this and finish in front of them they couldn’t believe their eyes. They all said they were going to make that for Labor Day. Thank you, I hope you’ll try it too. Oh and I’d love to have you in one of my classes. I hope you’ll try this simple tart. Not only is it pretty but it’s delicious too! Simply beautiful tart, Vicki! 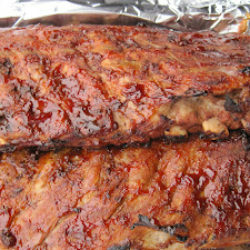 Your filling sounds luscious and quite easy! I have to bookmark this one. Have a great weekend! It was luscious, I hope you’ll try it. I hope you had a nice holiday weekend too! Yes it’s packed with vitamins, which is exactly what you get when you eat the colors of the rainbow. I hope you’ll try this. I try to eat the rainbow of colors as much as I can. Your tart looks so beautiful and inviting. 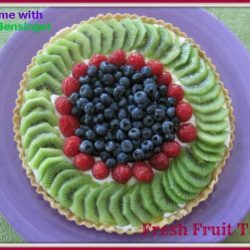 I love how your arranged the fruit on this tart it looks so pretty and makes me want to dig into it. Pretty pretty tart. I have not worked a lot with kiwi, have to go grab some. I finally figured out why I wasn’t getting any of your updates, glad that see some wonderful posts here..
Have a great day my dear.